The Union Budget 2018-2019 is an important event for the common man. A common man of India is expecting a lot of things from the budget 2018-19. It will be the first budget after the successful implementation of GST (Goods and service tax). Apart from this, it will be last full budget of the incumbent BJP lead NDA government before Lok Sabha Election 2019. So, due to many such reasons union budget 2018-19 is crucial. Union Budget 2018 will be presented by Honorable Finance Minister Mr.Arun Jaitley on February 1st, 2018. Usually, the budget is presented at the end of February month. So, it is quite early compared to our previous budget. This year Rail Budget is also merged with Union Budget. Let’s take a quick look at the expectation of common man from budget 2018. Well, the expectation from the budget is endless. People are expecting a lot of tax reform and social security measures in the budget. However, the government will take necessary actions as per the financial situation. I have tried to list down expectations of common man including salaried people. A first expectation from union budget 2018 is tax slab revision or flat tax structure. Post demonetization and GST implementation in 2017 taxpayer base have increased. In addition to that revenues from direct and indirect taxes has grown multifold. Every common man is expecting tax slab revision due to rise in indirect taxation income of the government. The present 80C limit is Rs.1.5 Lakh. This limit is towards investment in tax saving avenues like PF, PPF, insurance, ELSS, tax saving FD etc. This limit is insufficient. The common man deserves an extra boost of saving. As per me, this limit should be increased to 2-2.5 Lakh. Life insurance is a basic requirement for every individual. Currently, we get exemption of insurance premium payment under 80C. It is an overcrowded space. A separate deduction on life insurance will be a welcome move. As in India social security by the government is minimum, it is important to encourage people to buy financial protection life insurance. RERA implementation is a big relief for home buyers across India. However, real estate sector is still dull and need a boost from the government. As per current income tax rule limit of loss on House property is Rs.2 Lakh. This limit is under section 24 applicable for the second house and restricted for eight loan years. This limit can be enhanced or restriction can be removed. The current limit is applicable to the second house also. In India, we don’t have social security scheme. This year it is expected that finance minister will release social security scheme or medical security scheme. This is to ensure better life post-retirement. It may be some pension scheme or lump sum payment at the retirement age. Tax-free medical reimbursement limit is Rs.15000 for the salaried individual. This limit is not revised since many years. The cost of health care expenses has gone up like anything. The government should either consider tax free medical reimbursement or the limit of reimbursement should be enhanced. Tax-free gratuity is a long pending demand by the salaried individual. Currently tax-free limit for the gratuity is 10 Lakh. It is expected that this limit should be enhanced to 20 lakh in the union budget 2018-19. The price of certain products and services are increased after the introduction of GST. The common man is expecting GST rate cut on basic products and services used by almost every individual. This includes Insurance, transport, communication, and education. The Union Budget 2018-2019 is crucial not only for the common man but also for the government. The budget will also influence Lok Sabha Election 2019. 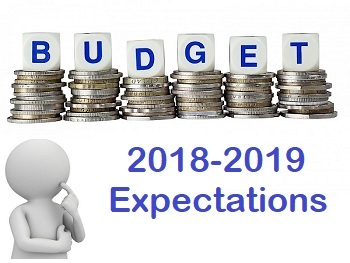 What are your expectations from the Union Budget 2018-19? Do share it in the comment section. Good. I am regular follower of Money excel. Keep up your good work. This is going to be a breakout Budget, not only it is going to be the last full Budget before the 2019 polls, but also the first one after GST implementation. The Gujarat election results will also play a part in the formulation of this year’s Budget. The overall limit for deduction under Section 80C needs a relook considering a slash in the Fixed Deposit Interest Rates and limited avenues for investment; it is time that the same is increased from INR 1.5 lakhs to INR 2 lakhs. The ever increasing medical costs may get the policy makers thinking to enhance the current Section 80D limit of INR 25,000. Similarly, the medical reimbursement limit needs a revisit, with the current limit standing at a meagre INR 15,000. From an indirect tax perspective, this budget will be of extreme interest since it will demonstrate the extent to which Central Government has a say in the larger indirect tax policy of the country. Hopes are high on upcoming Budget to endorse a sustainable growth environment for the Indian industry providing much needed tax certainty and resolution of initial teething issues being faced on account of GST implementation.